Eddie Slick, better known to comic book readers as the Firestorm villain Sand Demon, will appear on the forthcoming second episode of The Flash Season Two, titled "The Flash of Two Worlds." 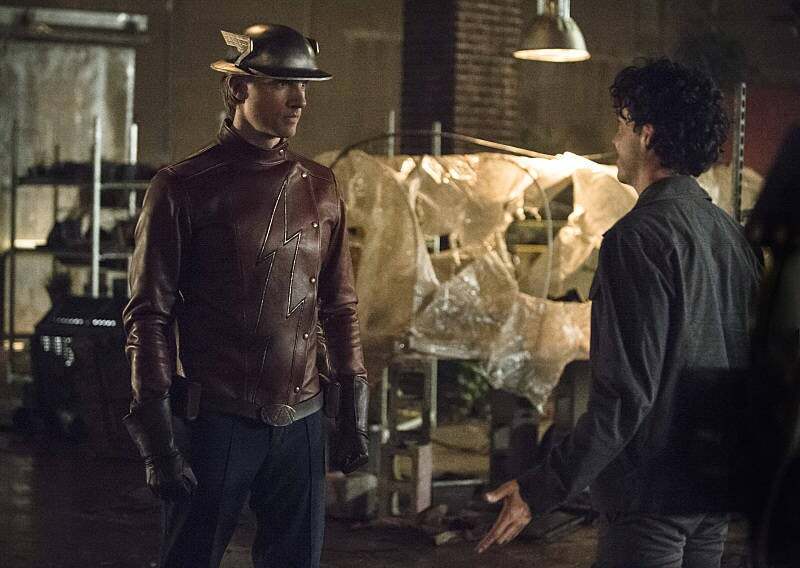 In the photo above, Teddy Sears is credited as Jay Garrick in the official caption from The CW, while Kett Turton is identified as as Eddie Slick. A look-alike of Martin Stein, he was a boxing promoter who sold steroids and had mob ties. When their operation collapsed, the mob blamed Slick and buried him alive, but he somehow discovered powers and was able to manipulate sand a la the Spider-Man villain Sandman. The character was created by Gerry Conway and Joe Brozowski, and first appeared in Firestorm #51 in 1986. He lasted just two years and died in Firestorm #75. "The Flash of Two Worlds" will air on October 13 at 8 p.m. ET/PT on The CW.